Gerontocracy to Dominate in Affluent Countries? In the midst of a record depression, Italy — “the world’s most dangerous economy” according to Time Magazine in 2011 — is risking the collapse or the impairment of its government in the coming weeks. Adding ungovernability to economic depression, Italy is becoming a threat to Europe. Two key politicians in this latest Italian drama are President of the Republic Giorgio Napolitano and former Prime Minister (and convicted criminal) Silvio Berlusconi. They are 88 and 77 years old respectively. Gerontocracy (rule by elders) is a soaring trend in rich countries. In most European countries, low fertility and the ageing of the population are shifting the intergenerational balance in favour of the elderly. Because of their increasing numbers, a growing proportion of societal resources are allocated to these elders, at a time when they are benefiting from growing political power. From 1990 to 2005, the age of the average Organisation for Economic Co-operation and Development (OECD) median voter increased three times faster than in the preceding 30 years. In some European countries (e.g., Italy and Germany) people aged 50 and older make up more than half of the voting population and this milestone is not long off for most of the EU. Distributive conflict over societal resources will play itself out more and more along generational lines, with elders increasingly gaining the upper hand over a shrinking percentage of younger citizens. This trend is confirmed by the Intergenerational Justice Index (IJI) that was published in April by the Bertelsmann Foundation as part of its Sustainable Governance Indicators project. This index offers a set of clear indicators addressing the three core principles of sustainability that represent important environmental, economic-fiscal and social aspects of this highly complex subject. According to the authors of the IJI, most OECD countries enjoy their prosperity to a considerable extent at the expense of their children and future generations. A worst case is Italy, where political gerontocracy is caused and affected by societal gerontocracy. All countries subjected to this trend could benefit from taking a look at the Italian situation and its consequences. The third largest economy of the eurozone, Italy is in the midst of what some qualify as its worst depression and is now struggling on the brink of the collapse of its government and the probable inability to form a more stable one. According to the think-tank Centro Europa Ricerche, since 2007, the decline in real available income per capita in Italy was greater than in the two worst Italian depressions of 1866-1871 and 1929-1935. Each child is currently born with a huge public debt, a growing proportion of tax income goes to service increasing state debt, productivity has staggered for a decade, GDP per capita shrank for six years, tax evasion and the black economy are one fifth of GDP, while unemployment, inequality and poverty continue to grow. Tens of thousands of young graduates emigrate each year. Italy hosts the third oldest population in the world. This fact, abetted by archaic electoral legislation by which the age of eligibility to vote for the Senate (or for half of the Parliament) is set at 25, ensures that both parliament and the government are dominated by the country’s elders. Among the 29 OECD countries covered by the IJI, Italy is 27th in both its overall index rating and for imbalance of social spending. Social spending for the elderly is seven times higher than for the remaining population, compared to three times in several other nations. Italy has the fifth highest poverty rate for young people. Public debt per child is €220,000 (US$297,000), second highest in the OECD. In Italy the interests of the elderly are strongly represented by ad hoc pensioners’ political parties and pensioners’ trade unions, while the young have nothing similar. 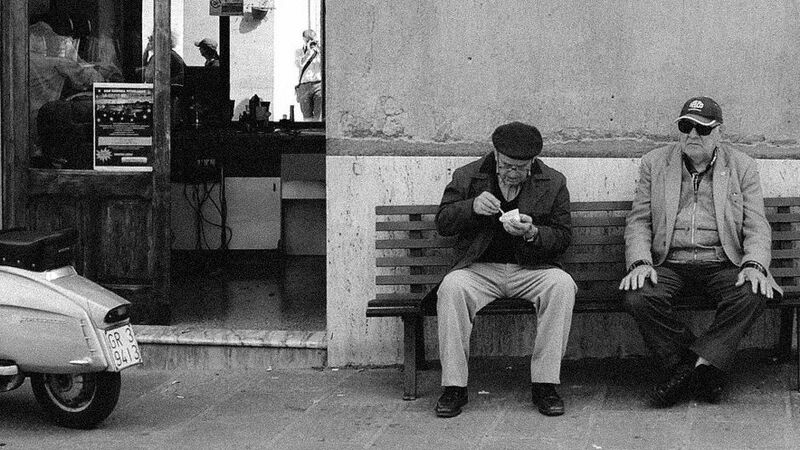 Sociologist Marco Albertini noted (link in Italian) that being old in 1977 Italy entailed a higher than average risk of low income, while in 2004 this risk was lower than average for the elderly and higher for those below forty. Albertini also points out that in the current phase of transition from a retributive to a contributive pension system, young workers are, in fact, paying contributions for two pensions: their own future pensions and those of current pensioners. Most of the income and assets of wealthy elderly Italians were accumulated during the decades of rapid economic growth after WWII. These assets are almost certainly greater than many current young people can expect, as Italy’s current youth live with GDP decline, job insecurity, underpayment, a youth unemployment rate of over 40 percent). Powerful positions in politics and business are often held by men generations older than their counterparts in other countries. President of the Republic Giorgio Napolitano is 88 years old; former President Carlo Azeglio Ciampi served until 86. The former (and perhaps returning) prime minister, Silvio Berlusconi, is 77 years old. “With an average age of 59 year, old Italian men of power are the oldest in Europe”, says a report by the University of Calabria (link in Italian). According to that report, the average age of university professors is 63 (only 78 out of 16,000 are younger than 40) and that of bankers and bishops is 67. During the last three election periods before 2013, only two of 2,500 members of parliament were younger than 30, while 25–29-year-olds make up 28 percent of the population. Finally, Italy is the only country in the world in which citizens only begin enjoying full political rights at age 25 and in which the government is determined by the oldest portion of the adult population due to this group’s demographic dominance. The median age of voters is 50 — and is expected to increase. While the world’s most common voting age is 18, the voting age for the Senate in Italy is 25. Of fifty million citizens aged 18 and older and allowed to vote for the Chamber of Deputies, 4.3 million (8 percent) are not allowed to vote for the Senate, whose vote of confidence is mandatory for any government. Given the disparate electoral bodies of the two chambers, their political majorities are often at odds. This was the case in the February 2013 elections that forced an unnatural government of left, right and middle parties. Had 18 to 24-year-old citizens been able to vote for the Senate, Italy would now have an equal political majority in both chambers and a more stable government. Nowadays, most decision makers tend to disregard the future negative impact of their decisions, especially in ecological, technological and financial matters, making choices aimed at maximizing short-term benefits. Hence many advocate giving more political influence to the young. The Foundation for the Rights of Future Generations advocates the right to vote from birth, exercised by parents for their children, until they become of age. Other organizations and authors either embrace this proposal or are in favour of the right to vote at age 16, as in Austria and Brazil. Seven decades of political gerontocracy in Italy effectively guaranteed a corresponding societal gerontocracy. In terms of a loss of generational renewal and the capacity for innovation and competitiveness, the social cost is unsustainable. As a first step to mitigate Italian gerontocracy, lowering the voting age from 25 to 18 is a simple measure that could be done immediately at zero cost. Generational balance and political stability in Italy will certainly benefit. The likelihood of an acute crisis in Italy, destabilizing the whole of Europe, would decrease. Gerontocracy to Dominate in Affluent Countries? by Marco Morosini is licensed under a Creative Commons Attribution-NonCommercial-ShareAlike 3.0 Unported License. Dr. Marco Morosini is a freelance journalist and author. Born in Milan in 1952 and educated in Italy and Germany, Morosini has worked since 2001 on indicator systems of sustainable development at the Swiss Federal Institute of Technology, where he was guest professor in 2004. He was editor of a study on the systems of sustainability indicators at the Centre for Technology Assessment in Baden-Württemberg, Germany. With Dr. Wolfgang Sachs, Morosini co-edited the Italian version of a Wuppertal Institute book, Futuro sostenibile, published in 2011. Morosini authored a column in the “Ethical living” section of the Italian news magazine Internazionale and has published articles in scientific journals and leading European newspapers such as Le Monde, Courrier International, Mediapart, Neue Zürcher Zeitung, Tageszeitung, Wochenzeitung, Avvenire and Internazionale.